I'm 30. I met my husband -- a cute, skinny Canadian boy -- when I was 17, and convinced that my body was freakish and undesirable. I weighed about 165 lbs at 5'5". But he found me beautiful. In fact, he told me that he found girls of all sizes beautiful, but would never admit to it due to the threat of heckling from his peers. The first time I got naked in front of him was the moment I realized my body was not disgusting and freakish and wrong. He loved me, just as I was -- not IN SPITE of my body, or BECAUSE of my body, but just as a whole person. My sense of self-acceptance grew from that point onward. 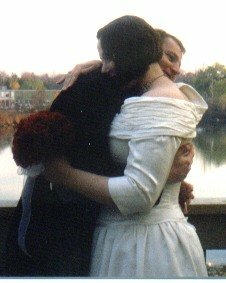 We were married ten years ago, when I weighed almost 200 lbs. I went through a difficult period of weight loss and hating myself, but he told me, frankly, that he didn't care what size I was, big or small. He just loved me. He supported my weight loss, because that's what I wanted. And when I decided to stop losing weight and learn to accept myself, he supported that too. He continues to, and I've since gained sixty pounds. He's always treated me the same, no matter what I weigh. He thinks I'm beautiful and desirable as a fat woman, just as he did when I was thinner. And he respects me. He listens to me when I talk. He cares about my ideas and opinions, even when I'm ranting like a nutcase. He admires my intelligence and passion, and he cares about my well-being. He shows his love for me in thousands of small ways daily -- he buys me little treats when he's out, he drops what he's doing to comfort me when I'm sad, he works and does chores so I can go to school, and write, and pursue my ambitions. We sit over coffee and talk together for hours. And he cares deeply about fat acceptance, even though he'll likely never be fat himself. That's part of the reason I love him back -- not just because of how he treats me, but because he is a deeply ethical person who believes in fairness; whose mind is open to new ideas, but also sharp enough to critically analyze those ideas; who can solve just about any problem, but isn't afraid to ask for help or admit when he's wrong; who truly loves people, while also maintaining a delightfully disgusting sense of humour. He is probably the best husband anyone could have.